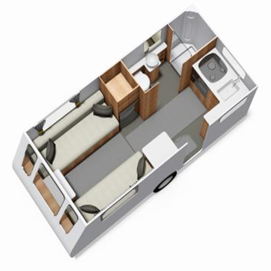 Want a lightweight two-berth caravan with a classic layout at a knockdown price? There’s not as much choice out there as you might think. 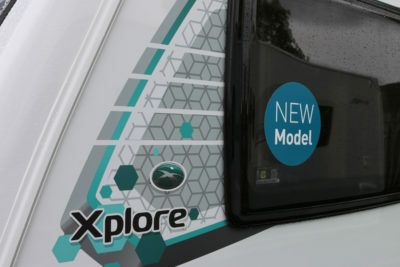 But Elddis, with its Xplore range, has certainly nailed the price – even if you really need to factor in the SE Pack – an extra £469 that brings you an Al-Ko AKS stabiliser, alloy wheels, steel spare wheel and carrier, a CD/radio with MP3 connectivity and axle wheel lock receiver. Once you’ve got the receiver you can invest in AL-KO’s axle wheel lock to beef up your caravan security and grab a sizeable caravan insurance saving. 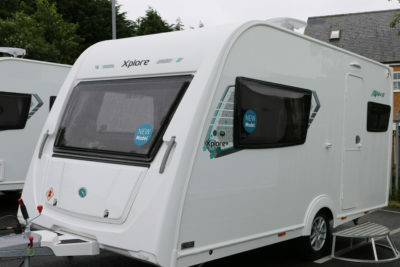 Xplores go down the same production line as their more upmarket Elddis-badged sisters, yet it still benefits from the same build values including – critically – the company’s SoLiD (Strong, Light, Dry) bodywork construction, with 10-year warranty. Although it’s a traditional wood frame with one-piece aluminium sides, the secret is it’s a bonded construction that’s designed to shut out water ingress. Even the awning rail is bonded. The single front window is, of course, an instant give-away that this is a budget model. Likewise the minimal graphics and windowless stable door. Inside, it’s a conventional layout for two – there’s an end kitchen with a rear corner washroom and the front is an unsurprising two-settee formula that offers a 1.99m x 1.50m double bed when it comes to sleeping. The chest of drawers at the front has a pull-out tabletop. Plus, there’s a free-standing table that stows in the wardrobe, itself set over the fridge. 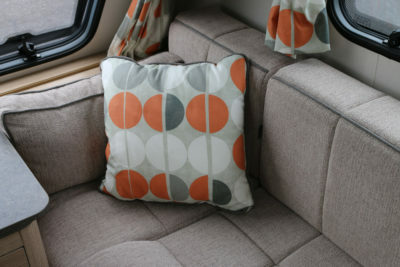 Curtains and cushions with a distinct orange spots design adds a bit of flamboyance. 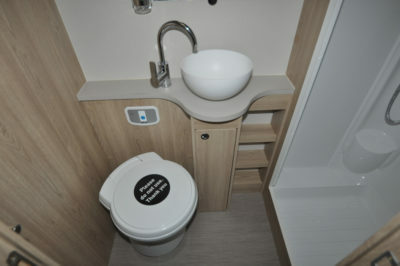 If that’s a touch retro, more modern fittings like LED lighting are here to bring this caravan up to the modern-day. 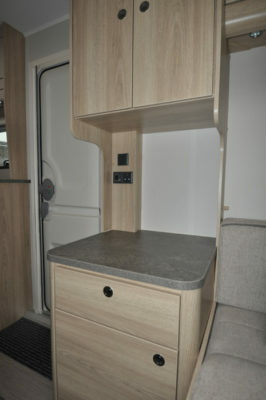 There’s also space to pop a TV on a unit opposite the wardrobe, with 230V, 12V and aerial sockets close to hand. A Teleco directional aerial is also supplied as standard. So far, so standard. 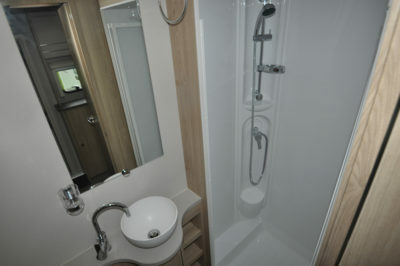 It’s the separate shower in the washroom that sets the Xplore 422 apart. Typically, past models with this floorplan (and it was once popular enough for all the major manufacturers to have two, three or more in their portfolios) were constrained with their washroom facilities. It’s a flat floor throughout, so it’s easy to step into the washroom, where you’re greeted by a swivel-bowl toilet plus a circular washbasin set on a work surface with a swan-neck mixer tap in chrome. That’s all set on a slim locker, with open shelving to its right. Beyond, there’s space for a proper, plastic-lined shower cubicle complete with riser bar and a single downlighter and plughole. Extending around the back, the L-shaped kitchen has a three-burner hob (including one larger gas ring) and a separate sink – both in a matt black enamel finish. 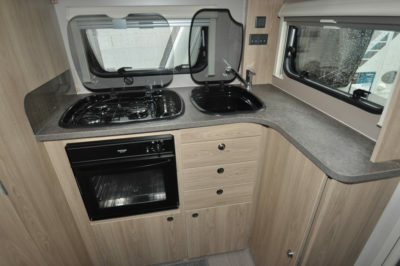 There’s a Duplex oven/grill and a good array of storage – drawers, two floor lockers, and a large slim cupboard along the side extending all the way to the back. Not upmarket enough for you? 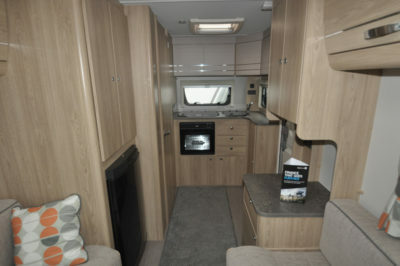 Check out the versions in the Elddis and Compass line-ups. 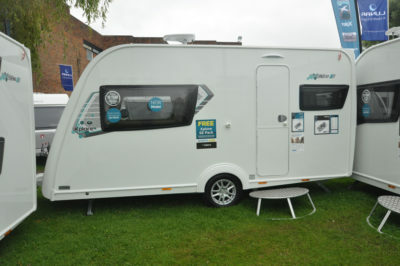 But, if great value holidays are what caravanning is really about, this little Xplore model has it in buckets and spades. And you won’t need a particular heavy towcar to tug it all around. Key options SE Pack (469), alternative upholsteries (£275), wrap-around front seating (£259), Al-Ko Secure Wheel Lock (£245), tracking systems (with first year’s subscription) (£280), extra locker shelving (£42), bike rack (£379), Al-Ko ATC (£453), alarm system (£310), exterior-access locker (£77), Omnivent (£225). 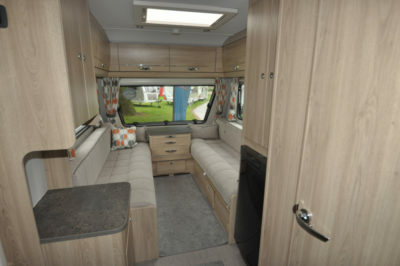 *Caravan insurance cost based on Elddis Xplore 422 caravan retailing at £14,744 fitted with hitchlock as standard, plus optional ALKO Secure axle wheel lock, ALKO ATC Trailer Control System, and alarm system as optional extras. Kept on drive at HX4 0BE behind locked gate post. Caravanners over 30 years old, claim free for three years and a member of a caravanning club. £100 excess. 180 days European cover and up to £75 per day for up to 15 days emergency accommodation cover included. Legal expenses cover, extended European cover and other emergency accommodation expenses cover options are available at extra cost. Quote includes 10% online discount and 12% Insurance Premium Tax and is correct as of 10.1.18.